"Hey, Strife! What's up?" asked my ten year old sister, Elena. Her dark, soft feathers brushed against the armchair as she jumped onto the coach instead. Being a Pteri, she had these somewhat small, lavender eyes and a small beak that curled up naturally, giving her a contented feeling. She looked up appealing at me, knowing I'd give in to whatever she wanted right now. My name is Raen_Strifemoon--Strife for short. I'm a checkered Shoyru, and currently fourteen. "Well, the's sky's up. So is the sun as well," I answered, smiling back at her. 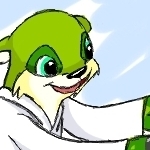 No matter what anybody said or argued, just seeing her could easily make any person (or neopet) smile. Not to mention her stupendous acting ability of doing the pouting look (which she actually hates). "Can you tell me how it was? You know, in the pound?" she asked slowly. I understand, since the pound was a delicate subject on my part. After a moment's worth of deciding on what to do, I finally answered, "Sure, Elena. You comfortable? Cool. OK, let's see...."
Back then, I was a yellow Lupe, I believe. Ten years old, and I was slightly tall for my age. I was in a cage. It was clean, and I was the only occupant in it. Anybody else who was inside was a painted pet, and was out before they were inside for ten seconds. I remember when owners came by, they would pass by me, expecting another to adopt me. 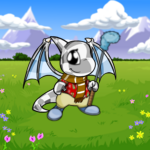 Owners passed by because they were mostly zappers, adopting pets with 'worse' names than mine to zap to a good color and disown, only to have the pet most likely be adopted by greedy owners who saw neopets as trophies. I was stuck all alone, my only friend had been adopted months before. One day, as I was about to take yet another nap, the door squeaked open, the bell ringing a bit. Hopeful eyes turned to the silhouette, and there she stood. Christine. She was small for her age, but her personality and attitude made up for it. As she strolled along, she looked at all the pets, trying to decide which to adopt. She had shoulder length dark hair, chocolate brown eyes, and had the most sympathetic smile I've ever seen. She took her time to look carefully at each pet, looking into their eyes. I was sure she'd adopt one of them in a snap before reaching me. Although, she did catch up to me finally. And just one look at me, she must have understood how I actually felt about the pound. Taking one last look at all the pets, she turned to me, knelt down to my face and whispered, "Do you want to come home with me, buddy?" Somehow, I nodded my head in astonishment. I was surprised, yet enthusiastic at the same time. I suddenly felt like the inside of my head was cheering, and my tail! The feeling of wagging my tail again felt so wonderful (since I was stuck in the pound), and soon, the cage opened. I followed Christine as we exited the room, the pets staring at me enviously and joyously. Once we were in the main room, Rose (the pink Uni who worked on adoptions) gave Christine several documents to sign. In just about five minutes, I was now her pet. We exited the building, and Christine immediately told me, "Call me Christine, OK? Mom sounds a bit weird to me, and personally, I prefer my name just fine." I nodded my head in response and replied, "OK, but call me Strife. Raen_Strifemoon sounds a bit weird to me." Christine laughed and agreed, and our bond started at that moment. As we walked several blocks to her house, she told me about my three sisters. There was Sue_Cute, a four year old Christmas Uni who loved her siblings and was called Sue, Melody_Time, a three year old blue Koi who was always supportive of her other siblings and was called Mel. But the pet she often talked about was Elena_Joyous. Elena was a blue Pteri, six years old, and wasn't at home most of the time. As she droned on, I found out that Elena was usually the one who took care of the family. She babysat for her sisters when Christine wasn't there, and could lull them to sleep by playing a lullaby on her piano. She usually acted like a motherly figure, but did have her moments when she was acting her age. Soon, we finally reached her house. It was fairly large for a two story, and the yard in front was lined with three colorful floors on each side. In the back, I could see a swing set and a standard brown picnic table. Christine walked up to the door and unlocked it using a gold key with the silver initials 'NH' engraved on it. Once she opened the door, we both walked inside, with Sue and Mel running up to us and bombarded the owner with questions. As Christine tried her best to respond to the talkative children, I noticed that they both wore white collared shirts and shorts. Mel's head was covered with curly, short flaming red hair, and Sue's had wavy white blond hair. "Is he our new brother?" "Can you make some food for us?" "How old are you, new brother?" "Calm down, you two. I'm sure they're both tired and want to get some sleep." All four of us turned to the source of the voice, and I suddenly knew why Christine talked so much of Elena. Instead of the strong, independent neopet I imagined her to be, she was actually small for her age. She looked two years younger than she did, and had these deep, serene blue eyes that said, "I'll always do my best for you, no matter what the circumstances are." She wore a plain lavender shirt, jeans, sneakers, and a white newsboy hat that had her hair stuffed inside. I wondered if she wore it all the time. Although, I didn't have time to wonder how long she wore it when I suddenly blurted out, "Hey, what's up, Fuzzhead?" As Mel and Sue laughed, Elena glared at me, her eyes now telling me, "You did not just say that." Immediately, I knew things wouldn't be off to a good start with us, but somehow, we'd be friends soon. That, I was sure would happen. When we met each other and talked (mostly about myself and my experience in the pound) during dinner at nine PM, my sisters soon finished up and finally went to bed. I sat alone at the table while Christine made us hot chocolate. She poured the hot, chocolate liquid in the coffee mugs when they were finished, and I took mine, taking care to blow carefully so that it wouldn't spill. I sipped once I was content with the drink's temperature, and smiled almost immediately. The hot chocolate was just at the right flavor, not too sweet and not too hot. Christine smiled, happy at my silent response, and drank her own. As I sipped mine yet again, I started to wonder if this was just a dream, or possibly another lab zapper. Slowly, I placed the cup down, suddenly not thirsty. Sensing my unease, Christine put her cup down and asked what was wrong. "You're not going to take me back to the pound, are you?" We both stared at each other. After several, painfully slow minutes, she responded in a serious, yet kind voice, "Strife, I've been to that pound every day, looking for the brother that I know my pets will like. I look at the pets, wishing I could adopt each and every one of them, but knowing I couldn't. I can tell you this right now, that you'll always be my pet. You're not some item that can be traded off or a trophy that's there for display. You'll never be traded away, not now, not ever. You'll always be Strife, and that's something to never forget." We stared at each other yet again for what must have been minutes, as the words finally sank in. Tears streamed down my face as I cried. Christine held out her arms and I hugged her. It was most likely the kindest, most wonderful thing that I've ever heard in my entire life, and just hearing that made me knew that she was telling the truth, because for the next four years I've lived with her, she told me the same thing every night before I went to bed. Each night I would remember that moment, reliving it as I fell asleep, knowing word for word that the promise would stay true. "...And that's my story," I finished. Elena must have fallen asleep just at the end, because she was curled up with her eyes closed with a smile. I laughed silently, and carefully placed a nearby couch pillow under her head. In the kitchen, Christine's voice hummed a calming lullaby. Smiling, I whispered, "Never be traded away, not now, not ever." Elena, Mel, Strife, and Sue are on a side account. I got the red belt. "Wait!' Vira called, gliding after it. "I won't hurt you! Come back!"